Core ontology for linked data registry services. Based on ISO19135 but heavily modified to suit Linked Data representations and applications. A reference to some internal or external Linked Data resource. The reg:reference gives the URI of the resource being referenced. If a reg:sourceGraph value is present then it is the URI for a named graph within the Registry containing the properties of the referenced entity. If reg:entityVersion is present it gives URI for the particular version:Version of the entity being referenced. Normally only one of reg:sourceGraph and reg:entityVersion is needed since versioned entities are normally stored in the default graph. A register item which simply forwards all requests to the delegation target. Represents a collection of registered items, together with some associated governance regime. If one or more licenses is stated then each license applies to all the entries in the register. A metadata record for an entry in a register. Note that cardinality constraints can be met by sub-properties, for example an item with a skos:prefLabel implies an rdfs:label and so meets the cardinality constraint on rdfs:label. Represents a SPARQL ASK query as might be used for validation. Represents a SPARQL CONSTRUCT query. Represents a SPARQL query as a reusable resource. Represents a SPARQL SELECT query. Optional classification for a registered item within one or more SKOS classification schemes to support navigation and discovery. Orthogonal to the structure provided by the register hierarchy which is about governance. The entity which has been registered. Default view for delegated resources, URL rewrite used A view used to redirect requests for delegated resources. Indicates the particular version:Version of the entity being referenced. A resource, such as a web accessible-document, which describes the governance policy applicable to this register. Indicates a specification for a view available for the entity described by this record. 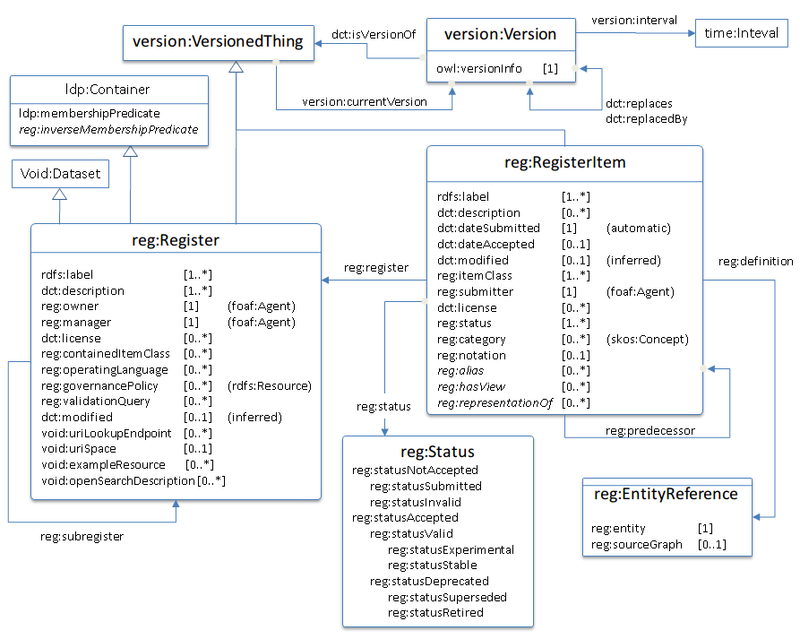 If the entity is itself a delegated register then the view provides a pattern for accessing all items within the delegated register. Particularly applicable to cases where the entity is not a RDF resource but where some service (such as a Web Feature Service) can provide a view of the entity. The type of the entity that this record is about. Note that it may be possible to register a non-RDF resource in which case this property provides a way to state the intended class of the entity even though no direct RDF assertion of type is available. The manager of the register, may be a person (foaf:Person) or an organization (org:Organization). Operates the register on behalf of the owner, makes day to day decisions on acceptance of entries based on agreed principles but it may be possible to appeal to the owner to override a decision by the manager. The owner of the register, may be a person (foaf:Person) or an organization (org:Organization). The owner has final authority over the contents of the regster. An item which has been replaced this one within the register. Should be asserted between hub resources (VersionedThing). The register in which this item has been registered. A resource, typically a real-world object, which the registered entity is a representation for. A resource representing an RDF graph (within the Registry's SPARQL dataset) containing the properties of the reference entity. If not present then assume default graph. The person or organization who originally submitted this register entry. Subsequent chages to the entry may have been made by other agents. Indicates a register that is itself an entry in this principle register. The HTTP status code to return the requester in order to forward the request. A short text string which can be used to denote the register item. Must be unique within the register. If available it should be used as the path segment, relative to the parent register, for the RegisterItem (and for the item itself, if managed). Restricted to be a syntactically legal URI segment (i.e. *pchar). This HTML document was obtained by processing the OWL ontology source code throughLODE, Live OWL Documentation Environment, developed bySilvio Peroni.